I have always said that I love this bag and I really love this bag. Every time I use it, I get that same feeling I had the very first time I tried it on. It seems so shallow and difficult to explain but all I can always say is I love this bag. I love this whole look! 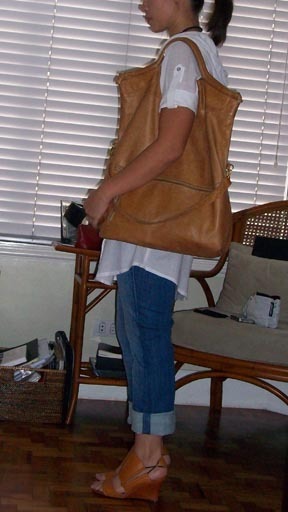 Your tote and shoes seem to elongate your entire frame! Very flattering =)….What’s even better is that you look very relaxed and comfortable in them, yet still so chic! Way to go!